Wisconsin court reporting service Brown & Jones recently posted a video on how to get the most out of videoconferencing services, a rising technology that's being used with video court reporting and video deposition services. According to Brown & Jones, it's important that those using videoconferencing services show up early to get comfortable and set up a good frame for the recipient. When getting into position, users should make sure that they are not too far away or too close to the camera and that their heads are not cut off from the frame. It's also important that users maintain eye contact with whomever they're speaking to, which can be done by looking directly into the camera lens. In addition, users can take this time to learn how to mute and unmute the audio before the conference begins. This can be important in the case that there may be something private a lawyer or business partner may want to discuss that they don't want the other party to hear. This transition from mute to unmute should be smooth and uneventful. 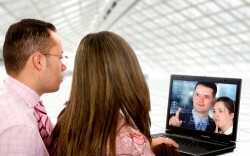 Also, when videoconferencing, users should wear long sleeve shirts as these do not draw attention from the face. In addition, it's important to avoid bright red, black or white clothes as well as any busy patterns or flashy jewelry. Light tones make an individual look larger on camera and dark tones make someone smaller, so a neutral color is perfect. Users should also avoid any excessive movement as it can be distracting. Furthermore, when ensuring that the recipients are getting clear audio so they can understand exactly what is being said to them – something critical to video depositions – users should limit any audible distractions such as paper shuffling, pen clicking or placing anything near the microphone. And, finally, by simply relaxing and following these tips, those in need of legal videographers or any other videoconferencing services can ensure they get the best experience possible. This entry was posted on Friday, August 10th, 2012 at 10:38 am	and is filed under All Posts, Video Conferencing. You can follow any responses to this entry through the RSS 2.0 feed. You can skip to the end and leave a response. Pinging is currently not allowed.